Complete feed for ornamental fish. Complete food for all tropical fish. BioActive + prebiotic. For health, colour and vitality. Biologically balanced. Mixture of seven different flakes consisting of more than 40 high-quality raw materials. Plus prebiotics for improved body functions and nutritional utilisation. For healthy fish & clear water. 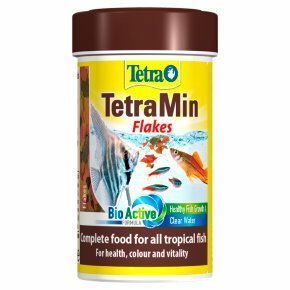 TetraMin - the biologically balanced flake food for healthy fish and clear water. Carefully selected mix of highly nutritious and functional ingredients with vitamins, minerals and trace elements providing a complete diet for daily feeding. Patented BioActive formula maintains a healthy immune system to ensure a long life. Feeding guide: Several times daily in small portions. Tip: For more variety, feed TetraRubin, TetraPhyll and FreshDelica.